my laptop is 100% connected to the teleport, but the webpage is stuck at 'teleport will resart during setup' it is telling me to reconnect to SSID of the teleport. I am. @alex-balcanquall Can you send teleport support info to gunars.ritins@ubnt.com? Does the issue persist if you reconnect to the teleport setup portal? It would help if you gave a step by step list of what you did. @ubnt-gunars it says please add emaill account to mail app - i don't uise the iOS mail app, i use outlook for home and citrix secure mail for work. Consider allowing us to 'send' the file to any app we choose (mail, drop box, etc). I will configure my mail at some point today and send. 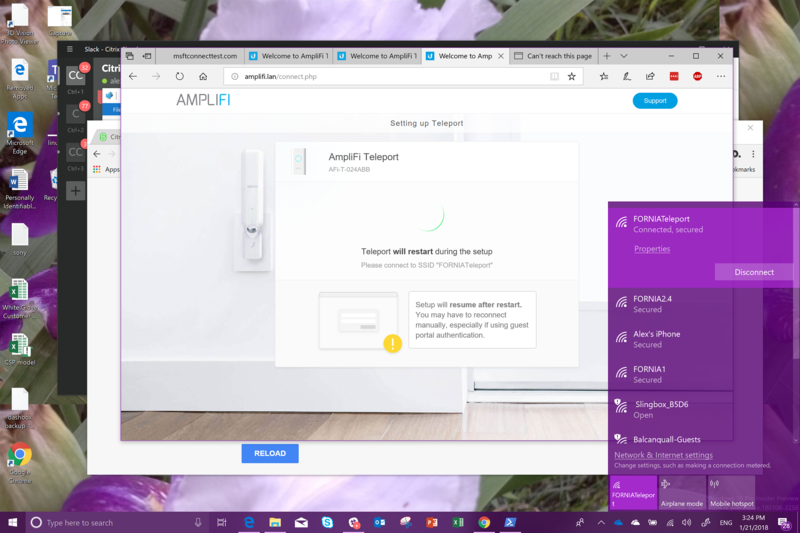 connected amplifi WAN port to my unifi switch which is behined a USG 3P with upnp turned on. i will upload pictures when i have converted them to the smaller size the forum needs. ok here you can see i am connected to the SSID i am supposed to be connected to but the teleport app circel just keeps spinng and manually re-pathing amplifi.lan results in cannot reach this page.